Hundred Reasons are an English alternative rock band from Aldershot, Hampshire, formed in 1999. The band consists of Colin Doran (vocals), Larry Hibbitt (guitar, vocals), Andy Gilmour (bass) and Andy Bews (drums). Having toured almost constantly for 14 months throughout the UK and Europe in support of their first releases EP1 (Cerebra), EP2 (Remmus) and EP3, (I'll Find You), Hundred Reasons released their debut album, Ideas Above Our Station (2002), to critical acclaim and commercial success. The album yielded the singles, "I'll find you", "If I Could", "Silver" and "Falter", and was followed by Shatterproof Is Not a Challenge in 2004. After being dropped by Columbia Records, the band signed with V2 Records and released their third studio album, Kill Your Own (2006). Guitarist and vocalist Paul Townsend departed from the band following its release, and was replaced by Ben Doyle for the band's fourth and final studio album, Quick the Word, Sharp the Action (2007). Following years of inactivity, the band reunited with Paul Townsend in 2012, and announced plans for a ten-year anniversary tour to celebrate the release of Ideas Above Our Station. 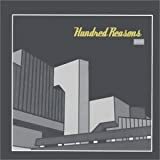 Hundred Reasons have had 6 top 40 hit singles, sold in excess of 400,000 albums, singles and downloads, and have been nominated for several Awards, winning three Kerrang! awards for: "Best New Band" (2000), "Best Album" (2002) and "Best Unsigned Act" (2004).